The beloved Laguna Beach Sawdust Festival officially opens today, and artists are finally ready for the two-month summer art extravaganza. Over 200 artists including jewelers, woodworkers, welders, glass blowers, painters, photographers and sculptors now populate the grounds. Several of the exhibitors have participated since its earliest years in the mid ‘60s. “It’s become less of a village and more of a city,” said Dion Wright, a 45-year participant. Wright creates welded sculptures that he says represent the creatures and the environment of Laguna Beach. started. “The first concession stand was just a cart with soft drinks and there wasn’t even an entryway with fence around the land,” said Wright. No admission was charged until a fence was installed around the booths and artwork. Wright currently works from a studio in Flagstaff, Ariz., where he now lives with his wife Ruth, who is also an artist and jeweler. The couple share a booth at the festival, where she displays her jewelry alongside her husband’s sculptures. “It’s not the materials you use, it’s how you use them,” said Mrs. Wright. The two met in New York at the studio of artist Dwight Morouse around 1974. Wright has shown his work in the festival since 1971 and his wife began exhibiting two years later. “We’re happy with each other,” she said. Other artists are equally loyal to the Sawdust Festival. For Douglas Miller, acrylic painter and violinist, this will be his 47th year exhibiting artwork at the Sawdust Festival. “I’m in more houses than any artist in Laguna,” claimed Miller, as he stacked numerous mini canvases, paintings of Laguna Beach scenes no more than seven or eight inches wide. Miller says he has painted continuously for 24 years, finishing one painting and then beginning a new one every single day. “I’ve never missed a day. Not one,” said Miller. He works from a studio in front of his house in Laguna Beach where he has completed an estimated 17,000 paintings. “I paint Laguna. I like to paint different beaches and what’s around me,” said Miller. Miller’s artistic nature plays out in another medium as well. He plays violin in the band Moon Police, which will perform at the festival in August. 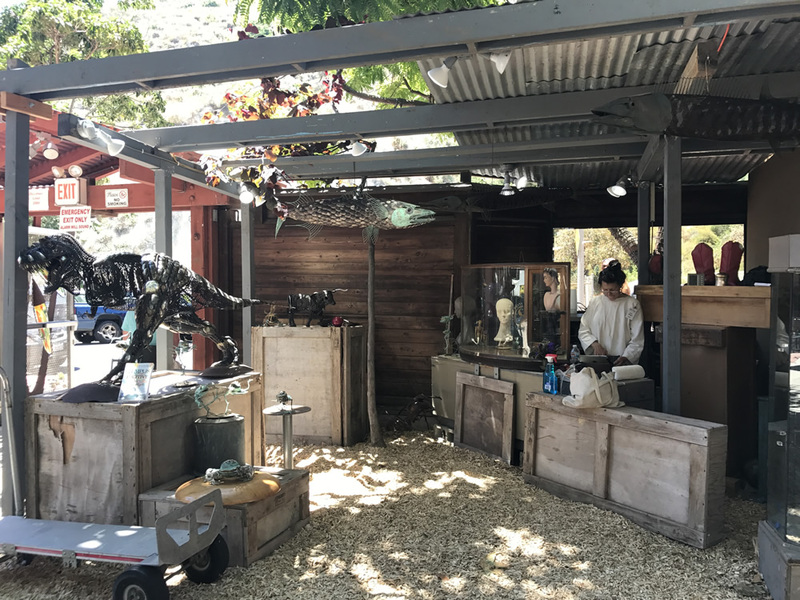 In addition to the Sawdust Festival, at 935 Laguna Canyon Road, the neighboring Art-A-Fair also opens today at 777 Laguna Canyon Road. More than 125 artists showcase their work on the open-air Art-a-Fair grounds, also an annual summer exhibition space for over 50 years. Art-A-Fair is open from 10 a.m. to 9 p.m. Sunday to Thursday and 10 a.m. to 10 p.m. on Friday and Saturday. Sawdust Festival is open from 10 a.m. to 10 p.m. daily, but closes at 6 p.m. on Tuesday, July 4. Both festivals run through Sept. 3. For Mrs. Wright, artists and residents continue to look forward to the Sawdust Festival every year. “It’s an opportunity and an incredible gift to the community,” she said. The Festival of Arts begins its 85th year and opens to the public Wednesday, July 5, displaying the work of 140 Orange County artists in a newly revamped space. Live music, hands-on art activities, tours, exhibitions of local student artwork and special events round out the summer-long festival. The new $10 million facility features a new layout for the art exhibit area, now sheltered by sweeping arcs of fabric, as well as for workshops, the gift shop and concert stage. Last remodeled in 1964, the renovated grounds have been updated to make them more accessible for the disabled while also freshening restrooms and widening pathways. The curtain also goes up on the Pageant of the Masters, with nightly public shows beginning July 7 through Aug. 31. The 90-minute “Grand Tour” features more than a score of tableaux vivants, known as living pictures, faithful re-creations of art works with real people posing to look like their counterparts in the original pieces. A live narrator serves as a guide through the story of each living picture accompanied by an orchestra. As a tribute to the Festival’s start on Aug. 13, 1932, the festival will waive admission for a birthday bash with cake and merry-making this Aug. 13. All events on the grounds, with the exception of the Pageant, are free with admission unless otherwise noted. For a complete list, visit LagunaFestivalofArts.org.